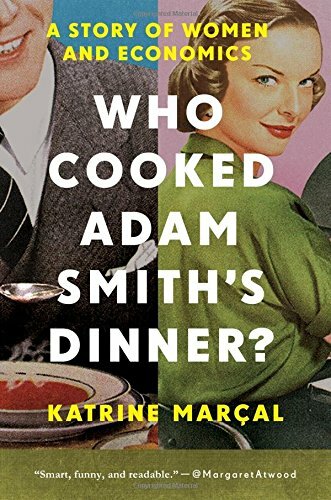 On My Reading List: Who Cooked Adam Smith's Dinner? How do you get your dinner? That is the basic question of economics. When economist and philosopher Adam Smith proclaimed that all our actions were motivated by self-interest, he used the example of the baker and the butcher as he laid the foundations for 'economic man.' He argued that the baker and butcher didn't give bread and meat out of the goodness of their hearts. It's an ironic point of view coming from a bachelor who lived with his mother for most of his life ― a woman who cooked his dinner every night… Nevertheless, the economic man has dominated our understanding of modern-day capitalism, with a focus on self-interest and the exclusion of all other motivations. Such a view point disregards the unpaid work of mothering, caring, cleaning and cooking. It insists that if women are paid less, then that's because their labor is worth less. Economics has told us a story about how the world works and we have swallowed it, hook, line and sinker. This story has not served women well. Now it's time to change it. A few months ago, I wrote an article about how over-the-top flattery of women in the workplace is often a "cover up" for the credit they are frequently denied in professional settings, as well as a way to reinforce "non confrontational" female behavior so that sexist work culture goes unchecked. It wasn't until I became a mother, however, that I became more sensitive to the lack of value associated with women's work. Before I had kids, I used to look at other women and mothers and think how wonderful it is that they effortlessly give so much of themselves. Having two sweet, beautiful children who run around the house screaming "No applesauce! No applesauce!" and spread bread crumbs on my bed helped to enlighten me. I now take women, their efforts, and the work they do more seriously in all aspects of life. These new insights into other people's lives have also made me contemplate the ways men lack support at work and at home as well. I'm excited to get more into that topic next week. While my "Before Kids" mentality may seem innocent enough, it's also probably why we often believe women are happy to take care of their families, colleagues, communities, and unwell relatives with disproportionate credit and support. It's also probably why we don't associate "motherhood" with the idea of economic contribution. I've always wanted to look into the economics of motherhood and female care-taking more closely. I can't wait to see what this book has to offer. Opinions? Comments? Insights? What thoughts do you have on this topic? What Food Could You Eat Forever?